Many sellers come to eBay for a hobby. Some have a passion for a product they can turn into a cash-generating hobby. Some have a house full of decades of accumulation and either want to cash in on their possessions or don’t want to leave the burden of downsizing to their grown children. Others come to eBay because a major life crisis has backed them into a corner and they must generate money to pay for necessities like rent, food, or medical bills. Lucretia Gann is one of those sellers whose eBay business came in handy when her husband fell ill.
Lucretia started selling as a hobby in 2003 to get rid of some books she had been hoarding. She had always been an avid reader and books were something she was passionate about and could sell easily. (It is always best to start eBay by selling things in your own home that you don’t want, need, or use anymore.) She found eBay was fun and the process worked well for her. She learned the eBay landscape, sold several items, and became a power seller quickly. Many seasoned sellers look back fondly at eBay in 2003 as “the good old days” because the process was easy—not as complicated as it is today. Back then, selling limits didn’t exist. Sellers could list and sell as many items as possible or desired, PayPal holds didn’t exist, sellers could leave negative feedback for buyers. The DSR system hadn’t come along yet and a return policy was optional. There were fewer sellers and less competition. It was the early days of eBay when you could even send a check to someone in the mail when purchasing an item. Lucretia always had a passion for dishes and glassware and had a big collection of pink depression glass. (Depression glass is machine made, color-tinted glass that was mass produced in the 1920s–1940s and commonly used as giveaways to entice customers to purchase items in stores.) She started dabbling in selling some of her glassware and then branched out to shopping at thrift stores and garage sales for more. She soon saw that dinnerware replacements were a profitable niche if you had knowledge of the brands and hallmarks. Lucretia had a library of about 20 books on glassware and dinnerware. She kept growing her knowledge base and now sells any and everything, including used clothing. Dinnerware and antique glassware is still her passion but she is open to selling anything she can make a profit on. Here is where eBay was a game changer, and a life changer for Lucretia. She and her husband both retired in 2013 and she continued to enjoy eBay as a hobby during retirement. eBay provided a nice extra income. Lucretia’s husband also had a part-time job driving for a dealership. Things were great and they were sailing along well in retirement and extra income. Then the other shoe dropped. In November of 2015, her husband had emergency bypass surgery and was hospitalized for three weeks, He came home and still had some trouble breathing. In January of 2016, he was diagnosed with Pulmonary Fibrosis (an incurable lung disease) and will be on oxygen from now on. So, unfortunately, and tragically, he can no longer work. Lucretia’s eBay business has been such a blessing to her family because she can stay home and take care of him and still make extra income. Lucretia is also blessed to still have her 89 and 90-year old parents that she also helps care for. eBay is truly a blessing for her family and provides the flexibility and extra income they need. eBay Is Great for Teens, Too! Lucretia also has a 16-year-old grandson carrying on the eBay tradition. He has taken a special interest in her eBay business all his life. When he was small and visiting his grandparents' home, he would help her pack eBay orders and ask all kinds of questions about her business. In early 2016, her grandson opened his own eBay account and PayPal account and his eBay business was born. He is doing quite well and will become a top rated seller very soon. eBay will be a wonderful part time job the rest of high school and through college. As most beginning eBay sellers do, he's selling his own items to learn the system. Lucretia has promised to take him thrifting, give him lots of tips and encouragement, and show him how to buy items for resale. eBay is great for teens because they already embrace the technology, can do most of an eBay business on a smartphone, and know how the cost of items teens buy. Furthermore, teens are fantastic customers on eBay because they have more disposable income than other age groups since they still live at home and generally don't have many expenses. More money to buy things online! Kudos to Lucretia for building her business and for being able to step up and care for her ill husband while running her business at home at the same time. As our population ages and our medical system changes, more and more people are finding themselves as caregivers at home rather than hospitalizing their loved ones or using long-term care facilities. In some families, the decision is made for a breadwinner to stay at home to care for a loved one. This is a tough decision for any family. 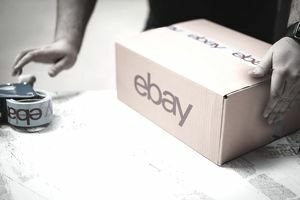 eBay provides an interesting distraction to the stress of being a caregiver, as well as provides a part or full-time income that helps sustain the family. eBay can be a hobby, a serious part-time or full-time job, and is definitely a family affair. The best thing about eBay is that it is flexible and scalable, and accessible to anyone. Visit Lucretia’s store, Plucky Lucky, on eBay.